Key Takeaway: Russia is preparing to escalate its military operations in Syria in order to tout its standing as a great power, reinforce its claims to be a credible partner against violent extremism, and reinvigorate domestic support for its continued participation in the Syrian Civil War. Russia has set conditions for a major demonstration of its military might following the completion of the latest in a long series of ‘humanitarian pauses’ in Aleppo City set to end on November 4. Russia’s sole aircraft carrier, the Admiral Kuznetsov, is expected to arrive off the Syrian Coast in the coming days. The arrival of the Kuznetsov with its accompanying fleet of cruise missile-equipped submarines and frigates signals Russia’s likely intent to conduct a new wave of strikes against strategically significant targets in Syria. The deployment comes amidst a recent opposition offensive to break the pro-regime siege of Aleppo City as well as continued pro-regime gains in the Eastern Ghouta Suburbs of Damascus. Russia will likely exploit opportunities in both Aleppo City and Damascus to highlight its ability to project force against "terrorism" and demonstrate the continued legitimacy of its client regime. Russia intends to escalate its military operations in Aleppo City and Damascus within the coming days in order to demonstrate its force projection capabilities and bolster flagging public appeal for its involvement in the conflict. Russia deployed its lone aircraft carrier - the Admiral Kuznetsov – to the Eastern Mediterranean Sea on or around October 17. The Kuznetsov is also carrying a contingent of Su-33 and MiG-29K/KUB fighter jets that Russian sources claim are equipped with precision-guided munitions, as well as Ka-52 attack helicopters armed with long-range anti-tank guided missiles. [i] The Kuznetsov is escorted by a battle group that includes as many as three submarines likely equipped with Kalibr long-range cruise missiles. The Kuznetsov reached the Mediterranean Sea on November 1 and is expected to arrive off the Syrian Coast in the coming days, where it will be joined by an additional frigate armed with Kalibr cruise missiles from the Black Sea Fleet. [ii] Once the battle group arrives, it will likely not remain idle. Russia will likely use these new assets to support pro-regime ground operations in Aleppo City or Damascus in an attempt to improve domestic support for its military intervention in the Syrian Civil War through a showcase of its naval and air capabilities. A recent poll by the Levada Center indicated that support for the intervention has begun to slip since 2015. [iii] Russians now doubt the Syrian Civil War as a route to improving Russia’s international image or finding common ground with the West. [iv] Russian President Vladimir Putin will likely attempt to reinvigorate these sentiments through a high-profile demonstration of military might and effectiveness. Russia has set conditions for a dramatic escalation in military activity in Aleppo City following a series of ‘humanitarian pauses’ and an overall decrease in the tempo of its air campaign. Russian President Vladimir Putin ordered the Russian Armed Forces to implement a ten-hour ‘humanitarian pause’ on November 4 in order to allow civilians and opposition fighters to evacuate Eastern Aleppo City. The temporary ceasefire follows a series of similar ‘humanitarian pauses’ in Aleppo City on October 20 – 22. The statement follows claims by the Russian Ministry of Defense that its warplanes have halted all air operations in Aleppo City since mid-October 2016. The tempo of the Russian air campaign against opposition-held areas of Eastern Aleppo City decreased significantly from October 28 to November 1 despite concerted opposition ground operations to break the pro-regime siege of Aleppo City. Russia nonetheless continued to conduct heavy airstrikes against opposition terrain on the southwestern outskirts of Aleppo City and its surrounding countryside as recently as October 26 – 27, according to local activist sources. The relative lull in airstrikes followed increasingly public threats of targeted sanctions from the U.S. and EU as well as calls for investigations into potential war crimes committed by pro-regime forces in Aleppo City, suggesting that Russia may aim to relieve mounting international backlash against its attempts to depopulate Aleppo City through an aggressive air campaign. Russia will likely use the Kuznetsov and its extant military assets in Syria in order to intensify operations against opposition forces in Aleppo City and its surrounding countryside, bolstering the regime’s crippling siege on opposition-held districts of the city. The imminent arrival of the Kuznetsov to the Syrian Coast is currently set to coincide with the expiration of the latest ‘humanitarian pause’ on November 4. Russia will likely use the airframes and cruise missile-equipped submarines accompanying the carrier as part of a new blitz against Eastern Aleppo City as well as core opposition-held terrain in Western Aleppo and Idlib Provinces. Recent infighting between opposition factions may render Eastern Aleppo City particularly vulnerable to such an escalation. Clashes erupted between the increasingly hardline Islamist opposition group Harakat Nour al-Din al-Zenki and current U.S.-backed TOW anti-tank missile recipient Fastaqim Kama Umirat in Eastern Aleppo City on November 2. Russia may attempt to exploit continued infighting by targeting these recently-exposed seams. Despite the infighting, neither the Kuznetsov nor the vessels in its battle group possess sufficient military capability to achieve a decisive victory for Syrian President Bashar al-Assad in Aleppo City. An escalation will nonetheless enable Russia to highlight its ability to project force against “terrorists” in a major urban center, draw parallels to ongoing operations by the U.S. in Mosul, and demonstrate its strength before a domestic audience. Russia could also leverage its renewed military intervention to enable the regime to successfully clear opposition forces from Damascus. Damascus holds more strategic significance to Russia than Aleppo City due to its political importance as the seat of government as well as its military role as the hub for military operations throughout Southern Syria. Russia currently weights its military efforts towards Northern Syria due to the threat that opposition groups pose to the regime in Aleppo City. However, Russia currently faces favorable conditions for its air campaign to expand to the capital. Pro-regime forces have set conditions for a major breakthrough in the capital city over the past three years through a brutal siege-and-starve campaign against the opposition-held suburbs. This campaign has now reached a critical tipping point. Pro-regime forces forced the surrender of the key opposition-held town of Darayya in the Western Ghouta Suburbs of Damascus on August 25, resulting in the forced displacement of the seven hundred opposition fighters and several thousand civilians that remained in the town. The regime concluded similar partial evacuations from the nearby opposition-held suburbs of Moadamiyeh, Qudsayya, and Hamah in October 2016 as part of ‘reconciliation agreements’ that brought the towns back under regime control. Pro-regime forces also tightened the siege on the remaining opposition-held pocket of Khan al-Shih in Western Ghouta after seizing the neighboring village of Deir Khabiyah on October 14. Meanwhile, pro-regime forces have also achieved significant gains against the opposition-held Eastern Ghouta Suburbs of Damascus. 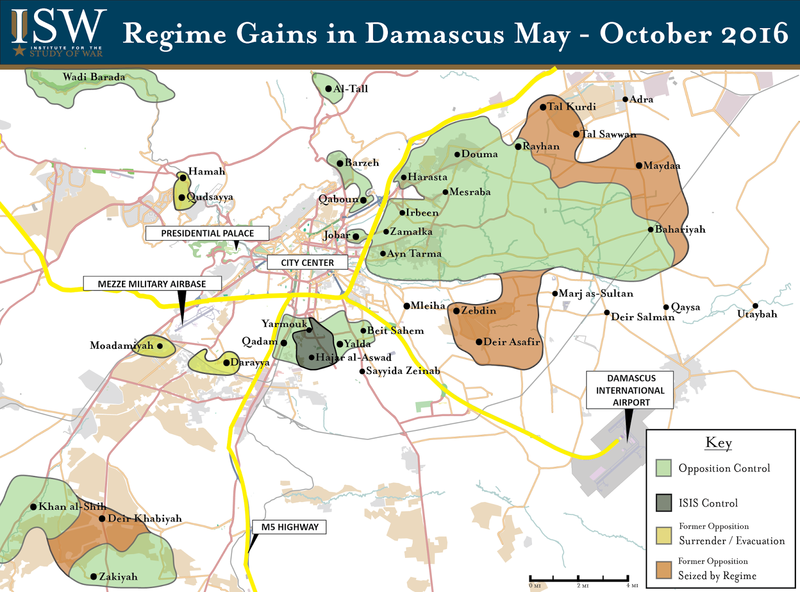 An eruption of opposition infighting between Salafi-Jihadist group Jaysh al-Islam and rival Islamist group Faylaq al-Rahman in May 2016 allowed the regime to secure significant gains in the rural farmland that serves as the breadbasket of the besieged opposition-held region. Pro-regime forces seized a steady string of towns over the intervening months, most recently the villages of Tel Kurdi and Tel Sawwan on October 29. These gains have brought pro-regime forces within five kilometers of the opposition stronghold of Douma near Damascus. These continued advances appear to have drawn interest from Russia, which resumed steady air operations targeting both Khan al-Shih and Eastern Ghouta in Damascus beginning in late September 2016. Russia may seek to exploit the demonstrated vulnerability of opposition factions in Damascus as another venue to demonstrate its military prowess and enable success for pro-regime forces on the ground. Russian President Vladimir Putin and Syrian President Bashar al-Assad appear increasingly confident in the possibility of their victory in the Syrian Civil War. Assad has conducted a public relations blitz since September 2016, conducting interviews with a number of media outlets in the U.S. and Europe with an eye towards demonstrating the stability of his position and the legitimacy of his rule. Syrian First Lady Asma al-Assad conducted a similar interview with state-owned ‘Rossiya 24’ in Russia on October 18 in her first public interview since 2011. This outreach peaked in a two-day conference held in Damascus on October 30 – 31 for several dozen journalists and analysts from the U.S. and Britain in which Assad stated his intent to finish his presidential term through at least 2021. These statements suggest that Putin and Assad do not anticipate a meaningful challenge to their position in Damascus – highlighting the likely intent of Russia to expand its offensive combat operations in the near-future. The Russian escalation as part of a Syrian regime offensive in Damascus and a counter-offensive in Aleppo will accelerate the radicalization of the opposition. Russian strikes by air and by sea will target acceptable opposition groups as they have during previous escalations to eliminate legitimate alternatives to the Assad regime. This continued pressure will hasten the ongoing transformation of the opposition into a movement dominated by Salafi-Jihadist groups such as Jabhat Fatah al-Sham, formerly known as Jabhat al-Nusra, al-Qaeda’s affiliate in Syria. In the absence of better options, acceptable opposition groups will increasingly cleave to extremist factions for self-preservation in the face of concerted pro-regime advances enabled by the Russian air campaign. Russia’s support to the Assad regime continues to remove potential partners for the U.S. against ISIS and al-Qaeda in Syria from the battlefield. The U.S. must therefore be willing to counter the support that Russia is currently providing to the Assad regime in order to achieve its national security objective in Syria.